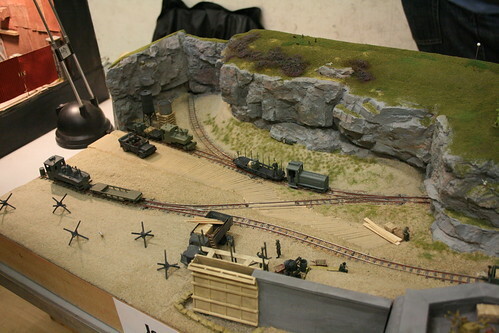 The Anniversary Challenge at ExpoNG this year celebrated both 25 years of the show and 4o of the organising group, the Greenwich & District Narrow Gauge Railway Society. The aim was to produce a layout with dimensions in a ratio 25:40, with a maximum size of 50cm x 80cm. I missed out on photos of a couple of the layouts as I didn’t get a chance to get round until quite late in the day, but those I did see were of a very high standard. The well deserved winner was Bernard Junk with Le Chêne Blanc, but it must have been a hard decision for the judges to make! Moreau et Fils by Les Coleman in Gn15. A great little industrial scene with a very well weathered Beetle as the centrepiece. 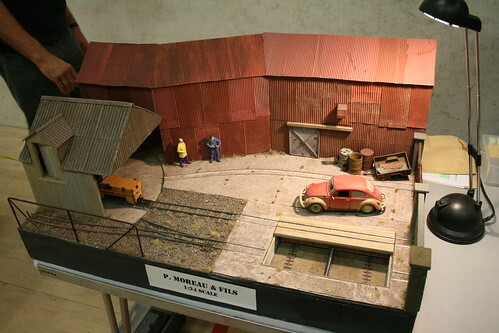 Coil End Lane by Lee Bryant in 4mm/ft scale. Three gauges (6.5mm, 9mm and 12mm) crammed in to 50x80cm is a pretty impressive achievement, especially when all the track has been hand made. Even the station traverser is dual gauge! Jersey 1942 by Neil Moss in 009. A scene depicting beach defences on German-occupied Jersey during WW2. The wooden shuttering around the wall being built is a great touch. 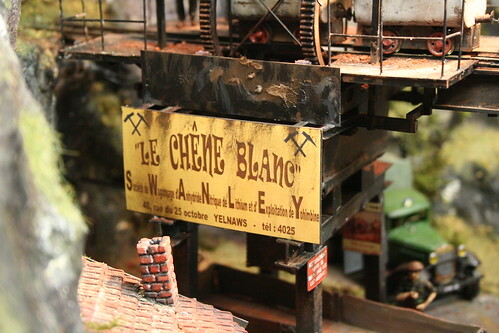 Le Chêne Blanc by Bernard Junk in 1:35n2. A mine loading facility somewhere in France. 1:35 scale (slightly smaller than Gauge 1) is gaining popularity as there are plenty of military figures and vehicles available at this size. Using 16.5mm track is also a good fit for 2′ gauge. 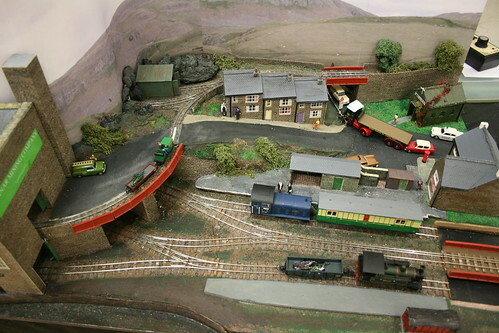 Bernard’s layout had a brilliant, pun packed detail in this sign. You can see my whole set of photos from the show on Flickr. 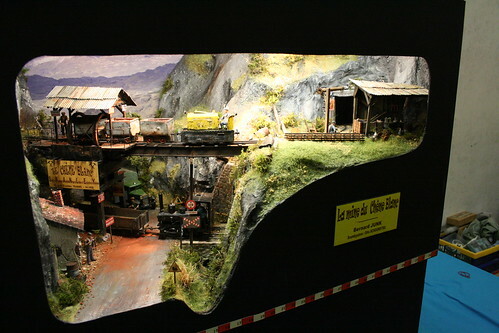 This entry was posted in exhibition, expong, Gn15, model railways, narrow gauge, photos. Bookmark the permalink.